Local collection and delivery is also available for a small additional charge to customers based in Eversley, Yateley, Hook (Hants), Hartley Wintney, Winnersh, Odiham, Finchampstead, Winchfield, Sandhurst, Crowthorne, Shinfield, Spencers Wood, Chineham, Basingstoke, Fleet (Hants), Church Crookham, Farnborough, Aldershot, Ash Vale, Frimley, Camberley, Bracknell, Bagshot, Ascot and Reading. Please contact us for more details on availability. 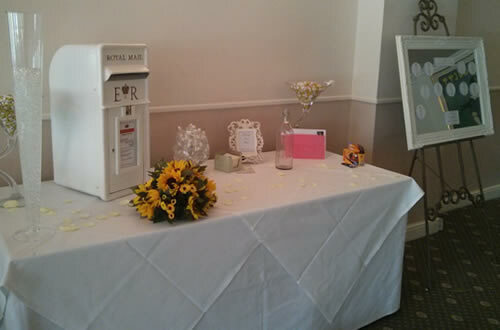 Keep your cards and monetary gifts safe by hiring a traditional Royal Mail post box as part of your wedding reception. A wedding post box is an affordable and fun way of taking care of valuable wedding cards, cheques, gift vouchers and small items received from loved ones on the 'big day'. In addition to acting as a safe method of storage our boxes are eye-catching conversation pieces that can be enjoyed by all guests in attendance. 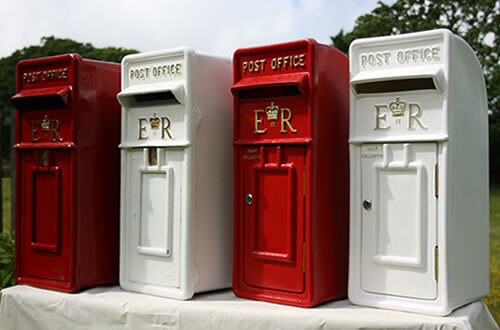 Like Routemaster buses, telephone boxes and the local pub, bold red pillar boxes and post boxes are an iconic part of the British landscape, and now wedding couples have the opportunity to add an intrinsic piece of our national heritage to their celebration. We are currently offering FREE DELIVERY AND COLLECTION for weddings at WARBROOK HOUSE, EVERSLEY and THE MILL HOUSE HOTEL, SWALLOWFIELD (subject to availability and delivery/collection time slots from venue). PLEASE NOTE: We are based in ARBORFIELD, near Wokingham in Berkshire and are conveniently located for customers holding special occasions in Reading, Basingstoke, Wokingham, Bracknell, Farnborough, Camberley, Fleet and Farnham. Boxes must be collected and returned to Arborfield by the customer OR we are able to deliver and collect in person for a small additional charge. Take a closer look at our range by viewing our image gallery! We can often cater for last minute bookings. Send us a message to bookings@perfectpostboxhire.co.uk or call 07771 865 200 and we'll let you know if we can help! © 2014 Design by Speedway Designs Ltd. COPYRIGHT NOTICE: No part of this website (including coding, imagery, graphics and wording) may be reproduced, copied, redistributed or sold without prior written consent from Speedway Designs Ltd. No responsibility is taken for content on external websites. Any promotions and offers advertised may be withdrawn without notice.